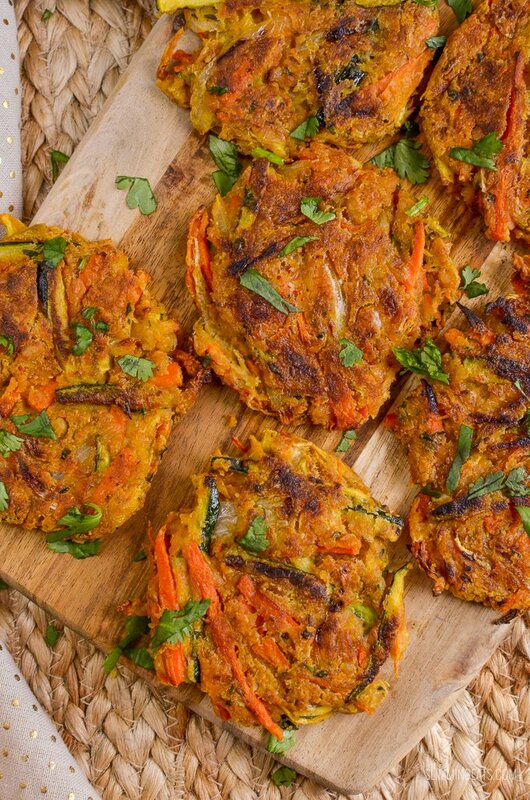 Normally vegetable pakoras are dipped in a batter with a unique blend of spices and deep fried for a crispy snack that is a favourite in India. So you can imagine my biggest dilemma when I was requested to come up with a low syn version, was to how to create a healthier, but still delicious version, that was not so heavy on the oil. 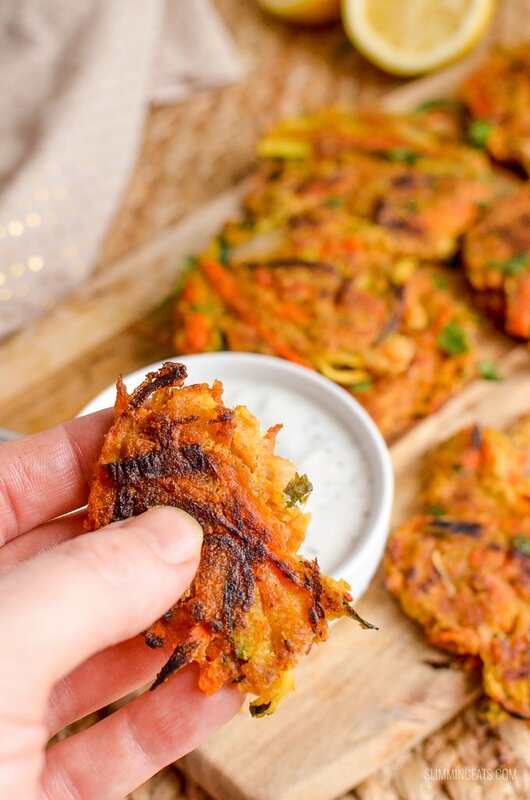 I straight up know a syn free version of vegetable pakoras was out of the question, there are many ways I could probably make a syn free version, but sometimes you just have to use oil and this is definitely one of those times. First up, I want to make a little bit of a point here, so many on Slimming World are scared off using oil or any kind of fat for that matter, assuming it is the worst thing on earth because it is not syn free. I am a strong believer in everything in moderation and there are some really healthy fats, despite the syn value. While certain spray oils are syn free, don’t forget that 1 tbs of oil in a dish that serves 4 people, for example, isn’t really many syns at all. Only 1.5 syns per serving and that there is exactly what syns are there for, yes they are also there to use on that bit of chocolate you might fancy later, but don’t be scared off using things, thinking they are unhealthy. I see this so many times. Sometimes using a bit of oil will really improve on the flavour, where you just won’t get the same result with spray oil. I already had planned out what vegetables, I wanted to include, mainly a mixture of some of the vegetables I had in my vegetable drawer in the fridge, nothing too fancy, vegetables that most of us have available to us on a weekly basis, well at least in my case anyway. Secondly was the blend of spices to use, I use cumin seeds, along with some other spices, such as coriander, chilli, garam masala and the usual salt and pepper. Obviously not forgetting a little bit of ginger and garlic, because nearly every Indian dish needs both those ingredients, right? I must add a little great tip here for the ginger and garlic. I don’t know about you, but years ago when I would buy a bag of garlic bulbs and ginger root I would never get round to using it all and it would spoil and get wasted and I’d have no choice but to throw it out. I really hate waste and so I am now constantly doing an inventory of the fridge and pantry to see what I need to use. So whenever I buy garlic and ginger, I come home from the grocery store and as soon as all the groceries are put away, the garlic and ginger gets frozen. For the garlic, I just throw the whole bulbs into a freezer bag, you would be amazed how easily they pop out of the skin when you need a clove of garlic or two in a recipe and they chop so easily, once left to defrost for just a minute or so. Ginger root, I recommend peeling before you add to a freezer bag, then as you need it, all you have to do is finely grate straight from frozen. So useful, as you will always have some on hand when you need it, providing you remember to keep stocking it up in the freezer that is, as it gets low. 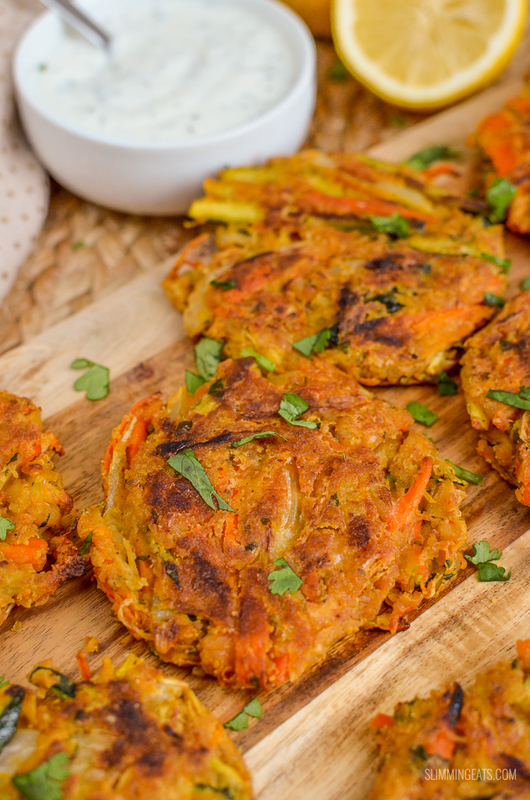 So with the vegetables and spices decided, the next and last part to these yummy Vegetable Pakoras was what to use to get them to hold together and at the same time get a little bit of a crisp exterior. I already have these delicious Syn Free Onion Bhaji, but didn’t want to use exactly the same technique for these, so I went for a mixture of some starch, egg and lastly chickpeas. It all worked perfectly, they got a lovely golden exterior as they hit the little bit of oil I used, tasted amazing and were the perfect accompaniment to my curry, served with a little bit of homemade Mint Yoghurt of course. You want to chop you vegetables quite thinly into matchsticks, so a good quality knife is important. I love my Santoku Knife, so long as it is sharpened regularly, it is perfect for chopping and slicing literally anything. The zucchini (courgette), can hold a lot of moisture, and we don’t want these to get too wet when cooking, so to draw out some of the liquid, once prepared, I add to a bowl or colander with a little salt and let them sit for 10 mins. Then you can place into between some kitchen paper or a clean tea towel a blot dry. The carrot and onion are fine just they way they are once sliced. Then go in the spices, egg and starch and mix till well combined and coated and lastly is the chickpeas. 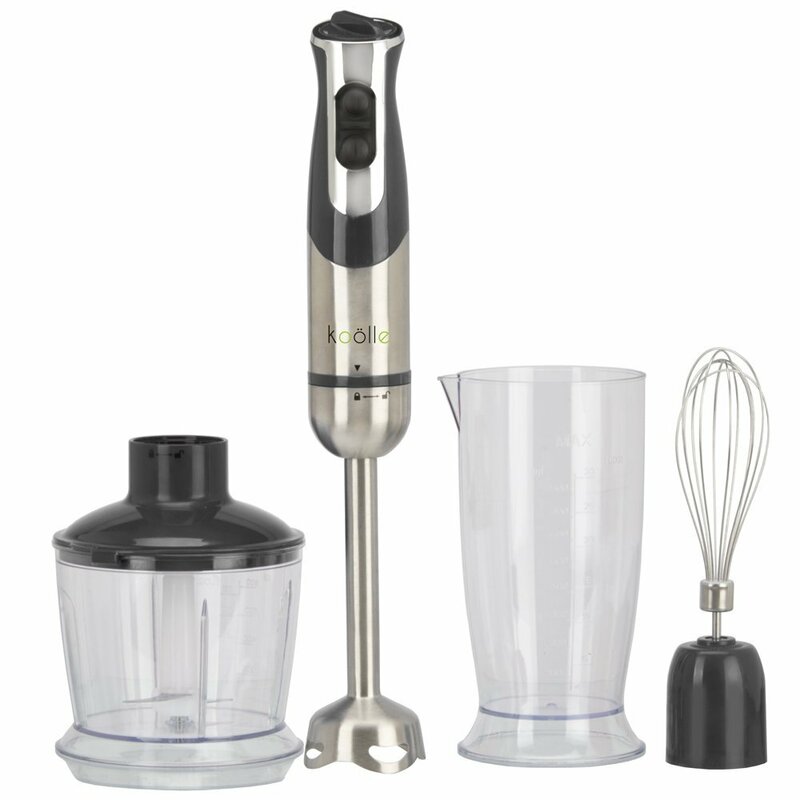 It comes in super handy when you want to chop or blitz a few ingredients, that would not be enough to add to a blender. I just add the drained chickpeas, to the food processor and spin the blade a few times till the chickpeas are really finely chopped, you don’t want to do it too much otherwise they will be too much of a paste and the vegetable pakoras mixture will be too wet. 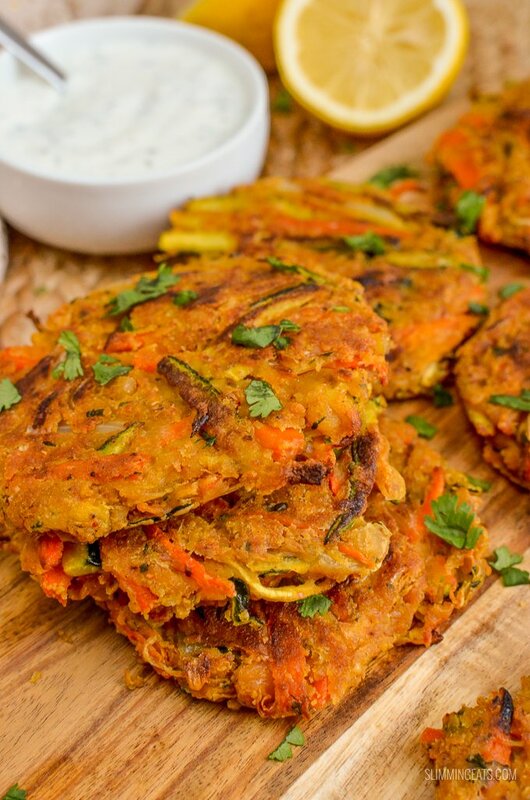 Once you add those into the other ingredients for the vegetable pakoras , you can fold all the ingredients together and then form into patties. I got the oven preheated at this point and got a baking tray lined with some parchment paper. So it was all ready and prepared. Then using a good quality non-stick pan, heat half the required oil until hot, it is important to ensure it is hot, otherwise you won’t get that lovely golden exterior. 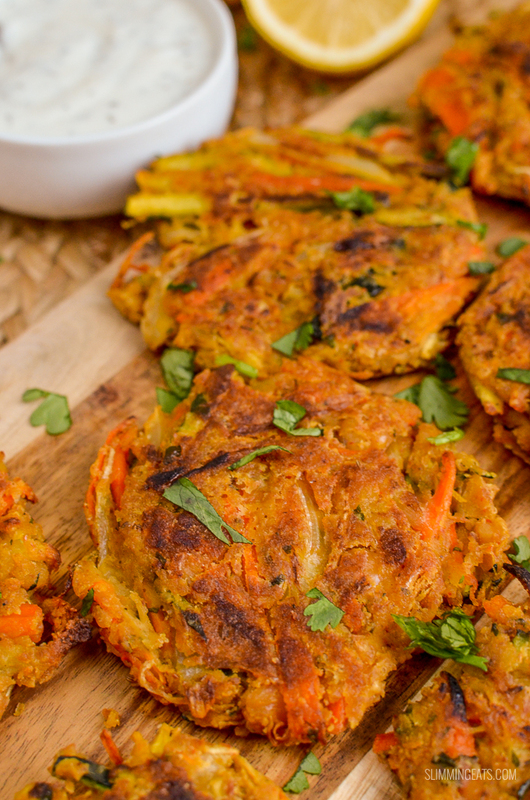 Then divide the mixture into 9 equal sized patties and place 4 pakoras in the pan, once golden on one side, carefully flip over and repeat on the other side and then you can transfer them to the tray. Then you need to repeat this with the other half the mixture, using the other half of oil, this time with 5 pakoras in the pan. Once all the vegetable pakoras are complete and on the baking tray, they can all go in the oven for approx 20 mins just to finish off and all that’s left to do is to make up the yummy Mint Yoghurt to dip them in, which I thought complimented them really well. I just mixed 1/2 cup of plain fat-free yoghurt with some finely chopped fresh mint, little juice of a fresh lemon, a pinch of sea salt, and add some sweetener. I like to use Sukrin:1 (as it is a natural sweetener with no aftertaste), to sweeten to taste. 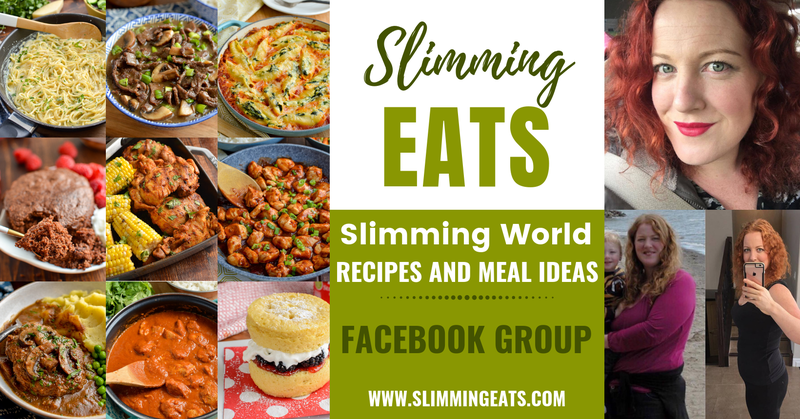 Don’t forget there is also my FULL RECIPE INDEX with over 500+ Delicious Slimming World recipes. 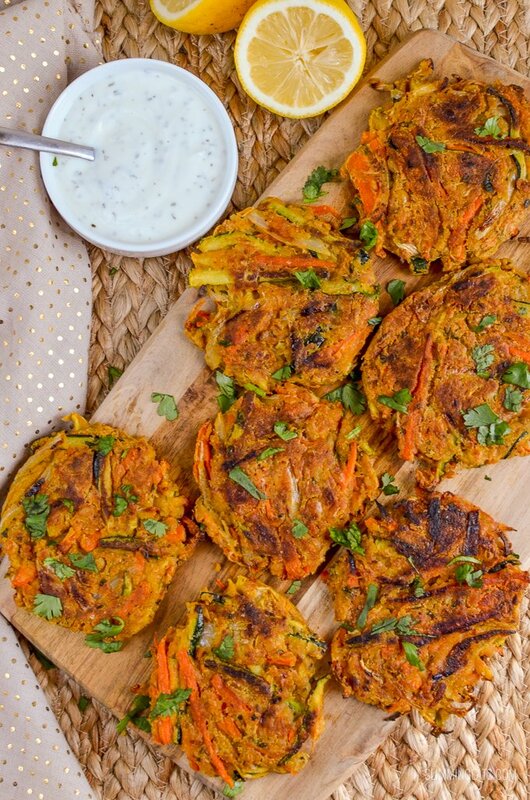 However if you are like me and can’t wait till dinner, serve these Vegetable Pakoras as a light meal exactly how they are – yum!! Add the zucchini to a colander over a bowl, add a little salt, and leave for 10 mins to draw out moisture. Place between kitchen paper or a clean tea towel and blot dry. Add to a bowl with the carrot, onion, garlic and ginger. Add all the spices and mix to coat. Add the chickpeas to a mini food processor (make sure you have drained them of all liquid) and pulse the blade a few times until they are finely chopped. Fold into the vegetable mixture with the cornstarch until all combined. Add 1/2 tbs of oil to a frying pan over a medium high heat. Transfer to a baking tray lined with parchment paper. 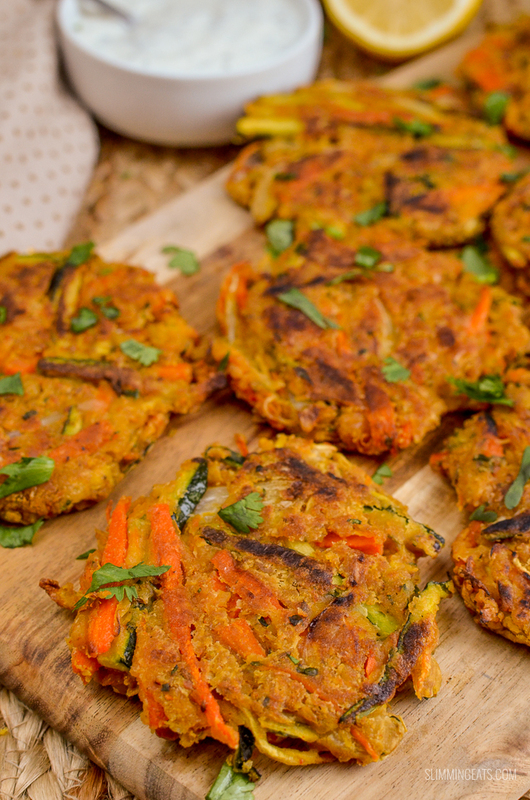 Transfer the second batch of patties to the tray and place in the oven and bake for approx 20 mins just to finish off. Perfect with some mint yoghurt. 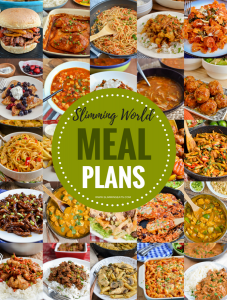 1/2 cup of fat free plain yoghurt, some chopped fresh mint, fresh lemon juice, a pinch of salt and a little sukrin: 1 or another sweetener of choice, to sweeten to taste. 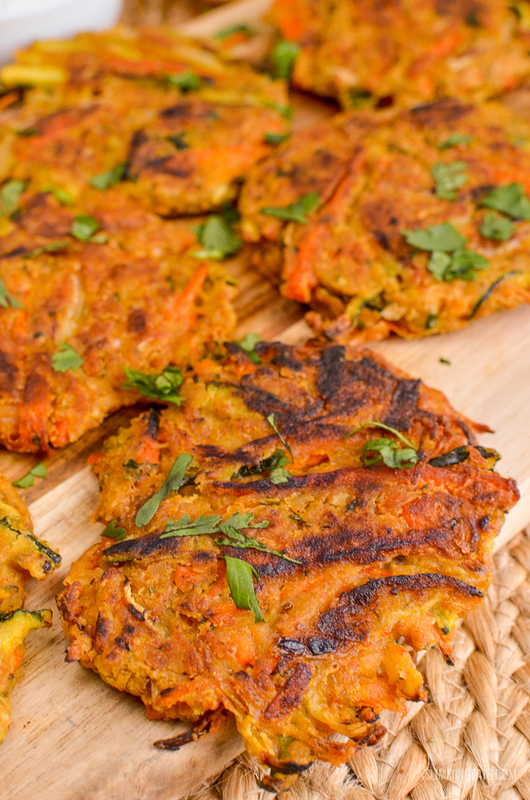 I love this recipe for Vegetable Pakora. Could you cook this in an Air Frier? I know you use the Tefal Actifry and I am thinking about getting one.